First cut a 6" x 9 1/2" piece of blue card stock and fold it in half for the base, a 4 1/2" x 5 3/4" piece of white for the middle layer and a 4 1/4" x 5 1/2" piece of white for the front layer. Next sponge the front layer's edges with Stampin' Up! Pacific Point ink making it darker around the bottom edge. Then tear or cut (I prefer tearing obviously lol!) a hill shaped piece of card stock to use as a mask for the snowbanks. Next apply removable adhesive along the top edge of the mask, apply it to your project then sponge a fairly thin dark line across the edge of the mask. *Hint-to avoid dark areas begin sponging beside your project and work your way onto it (it took me forever to figure this out lol!). Next while the mask is still in place stamp the trees in Stazon Jet Black ink, remove the mask and repeat until achieve your desired look. Then stamp the sentiment in Pacific Point ink, attach the front layer to the middle layer then to the base and enjoy! Linda I really like your card. 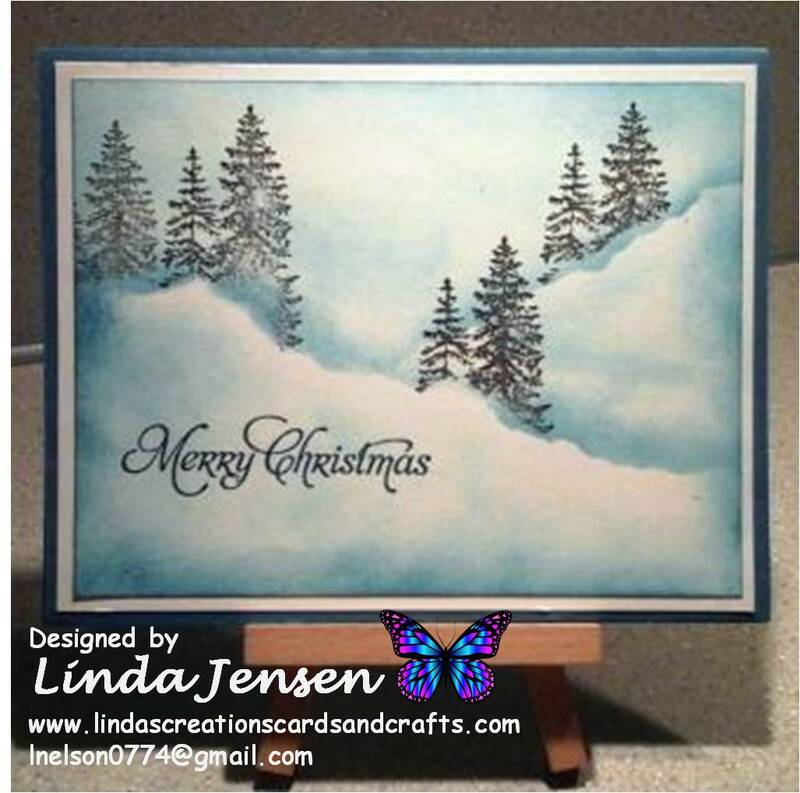 How did you get the snowy look on the trees? Did you use embossing powder? Hi Glenda, thank you for your question. I actually didn't do anything to make the trees appear snowy, that's just how they turned out when I stamped them with Stazon Jet Black ink. Wow, that is cool; thank you for answering my question..
No problem. I'm glad to see that someone's reading my blog lol! Take care and have a great day!